Regexp: verify that regexp calculations give the correct results. GameBoy Emulator: code that was supposed to run in strict mode now actually runs in strict mode. CodeLoad: make sure the code loaded is different on every iteration. 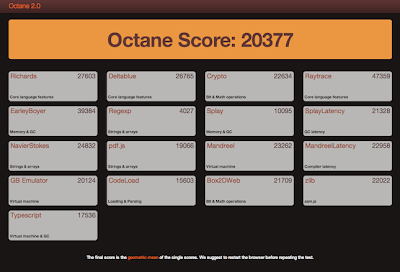 Octane 2.0 represents one more step in our continuing quest to deliver the best possible performance for users. You can run Octane 2.0 in your browser or read the documentation for an in-depth look at the new benchmarks.